Some magic should be forbidden. Reunited safely in Panar, Miara, Aven, and their friends have conquered more obstacles than they thought possible. The Akarian Assembly has accepted Aven and his magic—and Miara as his queen. But the problems for Akaria and its freemages are only beginning. One ally has vanished. Another teeters on the edge of death. And a third will face a choice between duty and love. Meanwhile, the Dark Master has marshalled the combined power of Mage Hall and Kavanar’s army. 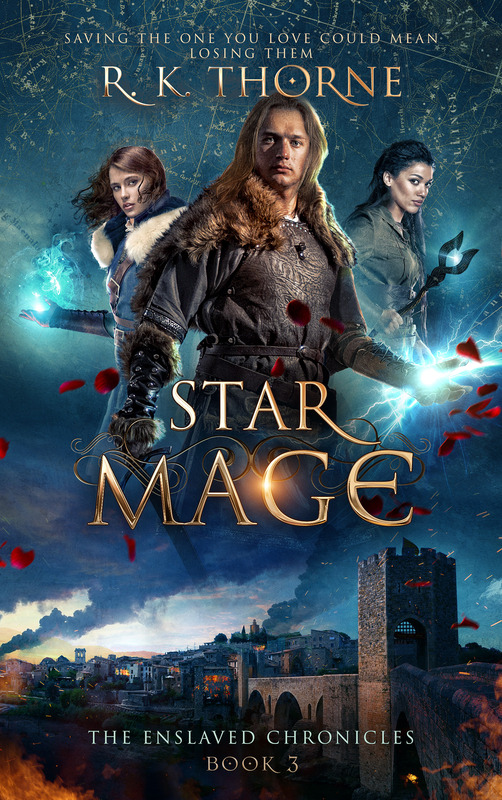 He’s closer than ever before to his goals: destroy the star mage and his magic, recapture those who’ve escaped, and seize all of Akaria for himself. 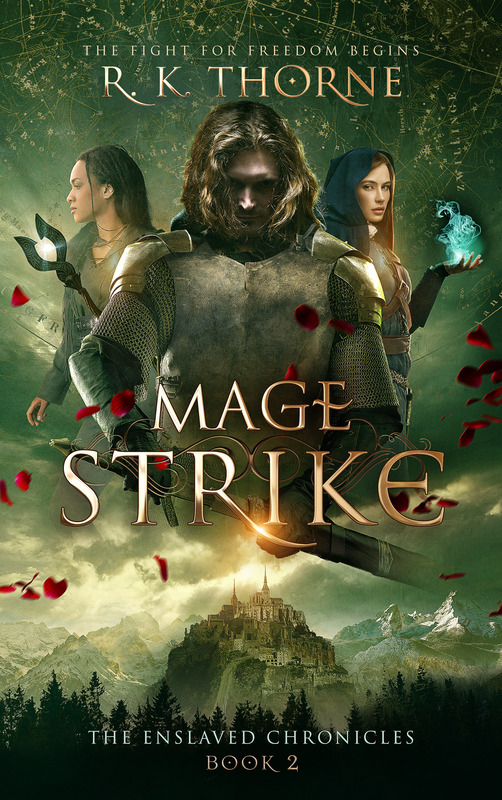 With the true, terrible potential of magic unleashed, no one can predict what destruction will be wrought. The struggle for the freedom of mage slaves culminates in all-out war in this third and final volume of the Enslaved Chronicles. Wincing, coughing, gasping, he struggled to roll to his left, go forward, to get up in some way that hopefully didn’t crush the person beneath him any further. He shook his head, trying to clear it, and finally turned out the inside of his tunic and wiped his eyes. The room came into slow focus. A gaping hole in the tower yawned a few yards from his feet. Nearly two floors had been cut into by the bombardment, or had collapsed afterward, and rubble was everywhere. Beyond the chasm, the rest of the chamber they’d met in remained but was now empty. Something bizarrely like thunder followed by brief bouts of sharp rain fell in the distance, like a brief moment of hail that ended as soon as it had begun. Strange. Blinking to clear his eyes, he peered back at the hole he’d climbed out of. A young woman sat in the cavity, equally bleary-eyed and coughing but clearly alive. Was that his handiwork, or was it luck? Her dress had been poor protection against the stone onslaught, its white now tinged to the pale color of bone, the thin gauze ripped in several places. Was that blood? Hair still a shade of near white fell in dramatic curls around her sharp, angular features and expressive, kohl-lined eyes. She would be attractive if she weren’t a traitor. The priestess Niat. He refused to let himself think amorously of anyone of her moral fabric; the mind was a thousand times more important than the corporeal form. He stepped forward and held out a hand to help her up. She squinted and frowned at him but accepted, stumbling to her feet. Temple sandals were also of little practical use against the rocky terrain she now found herself in, but then again, she hadn’t been planning on a hike, now had she? She stumbled against him, and he caught her, just barely. Apparently they were both due some good luck because when Thel ran toward a falling person, the poor soul usually ended up sprawled on the floor. Years of combat training had given him little grace and only moderate reflexes. Oh, he wasn’t half bad when he was paying attention. But he usually wasn’t. His thoughts were often elsewhere. That training had afforded him some strength, however much less than his brothers, and now he lifted her out of the depression they’d been trapped in and set her on her feet on the open floor behind him. Then he carefully stepped down and around her, hoping not to send either of them stumbling into the nearby gaping chasm by mistake. He tried to meet her eyes, but she stared up at the sky, openmouthed. They hadn’t been under there that long, had they? He followed her gaze. Above them, a dozen stones of various sizes floated in air. Most were pieces of the masonry that had once been the walls of the tower, jagged and angular, not like the boulders he’d imagined, and yet it had worked. Curious. The visualization did not have to be quite perfect, apparently. Yes, he was finally learning a little. He glanced back at Niat, only now to find her staring wide-eyed at him. The expression was a bit crazed. What, floating stone was more terrifying than nearly being crushed to death? His eyes caught on something on the side of her hip. “Why is your dress glowing?” he asked. She glanced down at her hip, then back at him, narrowing her eyes. 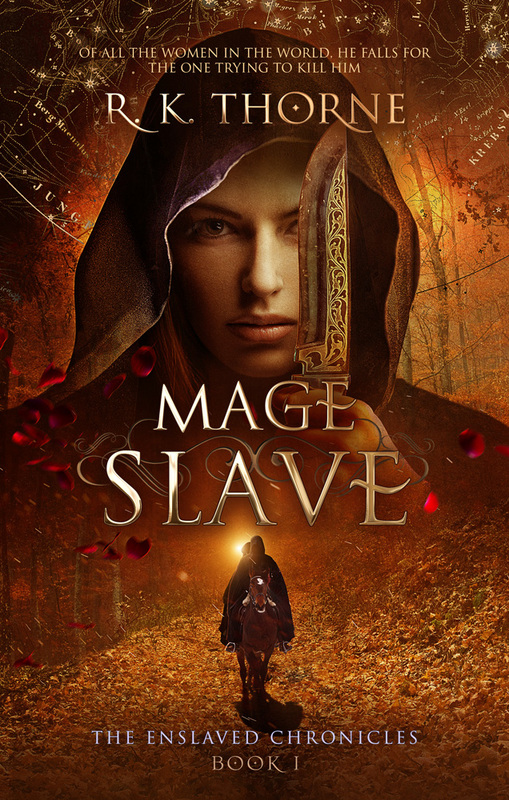 “Mage,” she hissed, like an insult, an accusation. He raised his eyebrows. “What does—” he started, hoping to ask again about her glowing hip, but in his distraction, he released some part of himself that was still connected to the stones. He realized his error almost immediately as her gaze darted up. Without looking—there was no time for that—he threw an arm around her and swept her a foot to the side and against him. A piece of masonry crashed into the spot where she’d stood, and she gaped, eyes wide as the dust swirled up and caught in the wind, reminding him just how high up they were. “—hands off me, mage,” she finally finished, pushing him away.